Our membership year is from High Holy Days to High Holy Days. The time to renew your membership is now, with your High Holy Days Registration. The number one reason to join is to make your personal statement of belonging. It means a lot to all of us. Our membership prices are very low, $ 180 for an individual and $ 360 for families. We can keep our prices low because we do NOT own a facility. Members receive special pricing for all our events, including the High Holy Day Services, our monthly Shabbat Morning Services, Holiday Celebrations during the year and our intimate Torah study group with Rabbis Stan and Laura. We publish a networking directory of members in November of each year and distribute it to the members. We also have a special rate for advance planning with Mt Sinai Mortuary & Cemetaries. Children are eligble for Bar & Bat Mitzvah classes and up to $1,000 in scholarships for summer programs in Israel. stay connected with like-minded folks in Jewish Renewal around the world! Let us encourage you to check out ALEPH’s web site. 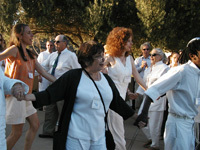 We, the B’nai Horin community, are committed to living more spiritually enriching lives. Together we learn, share and pray, experiencing our connection with “God” – God, you who are present everywhere in our world – most of all, deep within each of us. 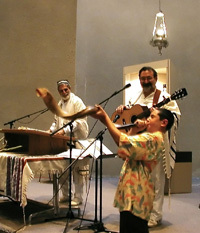 To learn more about our name, practices and guiding principles, read About B’nai Horin.